The sizeable contribution of the Arabian horse breed to the genetics of Austria’s iconic Lipizzaner horses have been described by European researchers. Thomas Druml and his colleagues focused their work on 158 Lipizzan horses from the Austrian federal stud farm of Piber and the Spanish Riding School. The Iberian bloodlines of Lipizzaner horses, a classical baroque riding horse, were crossbred with Arabian horses between 1776 and 1945. In their study, the researchers analysed the genetic contribution of the Arabian horse to the gene pool of the 158 horses and its association with the overall shape of the modern Lipizzaner. 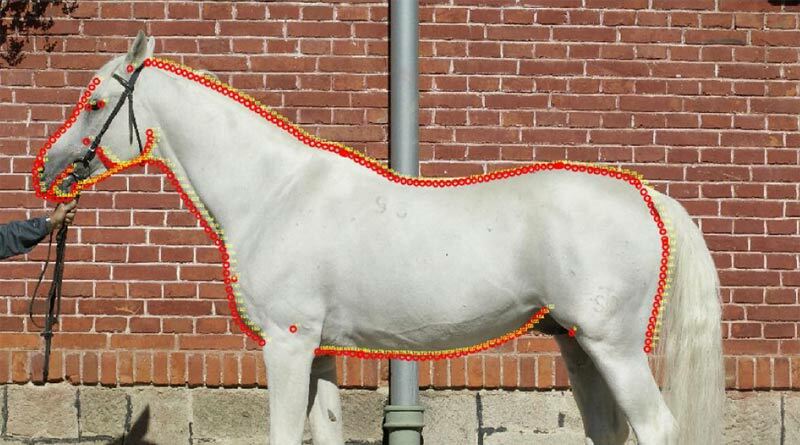 They found a significant association between Lipizzaner body shape and the Arabian breed’s genetic contribution, which varied from 21 to 29 percent. In order to compare and interpret the Lipizzaner shape transitions from Iberian type towards the oriental (Arabian) type, the study team included a sample of 32 Shagya Arabians from the Slovak National stud farm, Topol’cianky. The main body-shape differences due to increasing Arabian genetic contributions in Lipizzans were found in the conformation of the head, neck, withers, and legs. “Although selection in the Austrian Lipizzan breed favours the Iberian type, Arabian shape characteristics are still present,” they reported in the journal Archives Animal Breeding. The authors noted that oriental horses were commonly used for crossbreeding throughout the 19th century. While the English Thoroughbred is the current popular breed used for improving bloodlines, the Arabian horses played this important role a century before. For the Lipizzaner horse, 60% of its founder genes come from baroque Spanish and Italian ancestors born in the 18th century. Arabian breeding animals were used in the Lipizzaner breed between 1776 and 1945, and their founder gene proportion comprised about 23% in the populations of eight European Lipizzaner state stud farms. In the 19th century the breeding of Arabian horses was supported by the Austro-Hungarian Empire at some state stud farms. The resulting Arabian horse, today called the Shagya Arabian, represents a continental Arabian, based on the crossbreeding of original Arabian stallions with Turkish, Kazakh, Moldavian, and Hungarian founder mares that were born before 1800. From 1800 to 1934, original Arabian breeding mares and stallions were constantly imported from Syria in order to consolidate the Arabian population. Due to interactions between the Austro-Hungarian state stud farms and the imperial stud farm Lipica, both breeds, the Lipizzaner and the Shagya Arabian, share a common founder pool dating from 1810 to 1865. The authors conducted a pedigree analysis on the 158 Lipizzaner horses in the study – which represents the actual state-owned Austrian Lipizzaner breeding population – in order to determine their individual Arabian gene proportions. The pedigree work ranged back 33 generations. For the same set of animals, they collected standardized digital photographs of each animal for the body shape analysis. They applied what is know as shape regression, in which shape coordinates are regressed on to the individual Arabian gene proportions. In total, the Lipizzan gene pool of this sample was defined by 434 founder animals, whereas the 15 most influential founder animals, including four Arabian stallions, accounted for 50% of the pool. The average genetic contribution of Arabian founders to the gene pool of the Lipizzan population of the federal stud farm of Piber and the Spanish Riding School was found to be 26%. It was contributed by 72 founder animals (22 mares contributing 1.4% and 50 stallions contributing 24.6%). Of the Arabian genes, 20.1% were from imported original Arabians from Syria between the years 1800 and 1865. Most of these 22 original Arabians were the founder animals for the Shagya Arabian breed in the state stud farms of the Austro-Hungarian monarchy at the same time. Furthermore, 32 Shagya Arabians contributed 1.4% of genes from 1817 to 1934. The remaining 4.5% of the Arabian gene pool was contributed by so-called Arabian founders (15 horses), Anglo-Arabian founders (one horse), purebred Arabians (three purebred Arabian stallions), one Tunisian stallion, and three Turco-Arabian stallions. On an individual basis, the Arabian genetic contributions varied from 21% to 29%. “In our study, the main characteristics of higher Arabian gene proportions were found in conformation of the head, neck, withers, and extremities,” they reported. The major characteristics of the traditional Iberian or baroque type horses were a well-muscled, well-curved topline, a heavier ram-shaped head profile; and a clear quadratic format. The counterpart, the oriental Lipizzaner shape, was characterised by a smaller head with a linear nose profile; clearly visible withers; a long, straight back; and a rectangular format. The study team, which comprised Druml, Michaela Horna, Gertrud Grilz-Seger, Maximilian Dobretsberger and Gottfried Brem, said their work showed that techniques of shape analysis were able to differentiate phenotypes associated with the gene pool and can be applied for phenotypic evaluation and prediction in crossbreeding programs. The authors are variously affiliated with the University of Veterinary Medicine, Vienna, and the Slovak University of Agriculture. Grilz-Seger is an independent researcher.